We recently published a post highlighting some of the best Chef’s Tables in the country and in the course of our research we noticed a growing trend in ‘Sommelier’s Tables’ also. Once only a feature in the very finest of mainly French restaurants, Sommeliers now reside in upmarket establishments of all types of cuisine, as long as it has a wine list to support them. And it’s not just wine they are recommending. Sommeliers these days are pairing beer with food and this year for the first time ever outside of Japan the Sake Sommelier of the Year Awards were held in London. It appears that Sommeliers have become stars in their own right and the new school of talented men and women are setting trends and hosting their own tables. Our fascination with fine wine doesn’t stop at simply being guided in our pairing choices either. ‘Cellar Dining’ is becoming very popular, particularly for private dinners and functions – guests want to actually get among the bottles and see the wine collections up close. 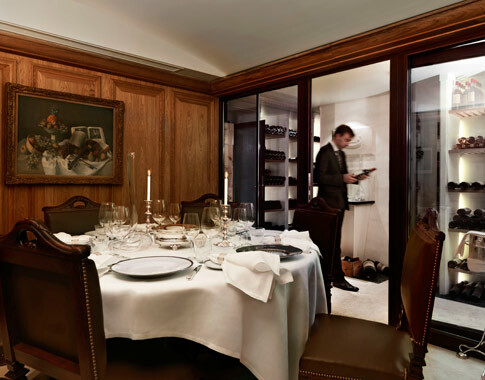 We have had a good trawl through dusty cellars up and down the country and have come up with a list of Ten of the Best Sommelier’s Tables and Cellar Dining Rooms. Enjoy a gourmet menu designed by famed chef, Hélène Darroze whilst dining in the limestone clad cellar of The Connaught Hotel. Housing over 6,000 vintage wines, the cellar creates an inspiring setting for your epicurean discovery with matching wines presented by the Head Sommelier. Available for parties of between 6 and 8 guests the Sommelier’s Table is available Tuesday through to Saturday from 11.00am – 11.00pm. For further information email dining@the-connaught.co.uk or call 0 20 3147 7200. Previously hidden from view, the original subterranean Victorian cellar of the South Lodge Hotel has been fabulously restored, creating a unique, new space for guests to enjoy. 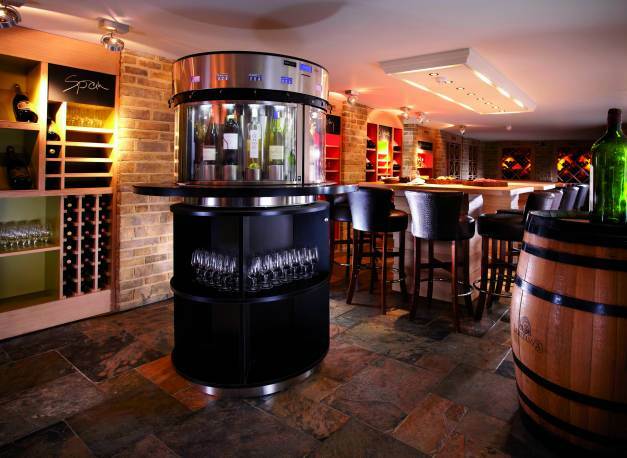 At the heart of the cellar is a large tasting table and each day a selection of 16 wines is available on demand. Guests are also able to buy a ‘decanting card’ that enables the sophisticated Eno-Round® Wine Serving System to pour the required measure. Choose a wine to accompany dinner in one of South Lodge’s restaurants or simply sit and enjoy a few different bottles with one of their sharing plates in The Cellar itself. Head Sommelier Dominic Roberts also holds lively tutored tasting sessions sharing wines new to the cellar. For information call 01403 891711. For a truly unique dining experience, The Riedel Cellar at The Chester Grosvenor is a must. 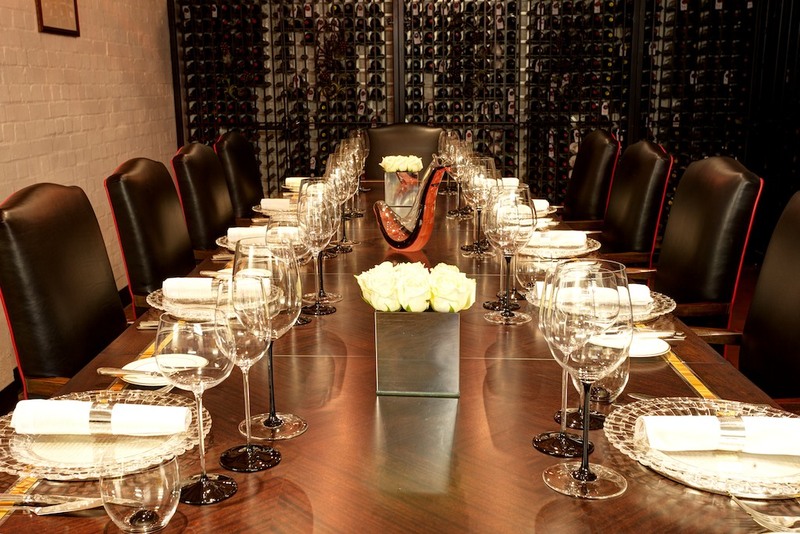 As well as being one of the UK’s most comprehensive wine cellars with almost 10,000 bottles of wine and champagne in stock, it is also a private fine dining venue offering bespoke menus designed by Michelin star chef Simon Radley and his team. Running under Eastgate, the road which runs through Chester city centre, parts of the cellar predate the hotel which opened in 1865, creating historic and distinctive surroundings. Seated at a specially commissioned mahogany and silver inlaid dining table diners enjoy an individually designed menu which celebrates British classics with a distinctive Simon Radley twist. To make an enquiry please call 01244 895618. 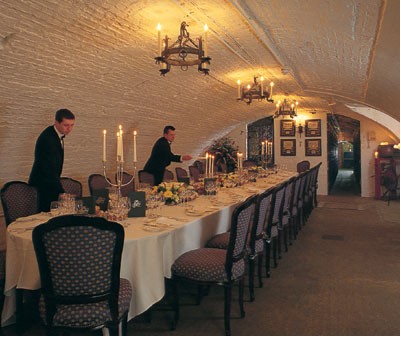 The Sommelier’s Table, in Gleneagles’ atmospheric cellars, is a gourmand’s paradise. The Cellars, in the heart of the hotel, retain many original features, including the railway bay where wines were once delivered from all over Europe. This unusual space is decorated with artefacts and archive material from throughout the hotel’s long, proud history. The Sommelier’s Table gives your small group the opportunity to sample a selection of some of the finest wines they have during a dinner chosen to perfectly complement the vintages on offer. Guests also have the opportunity to have a private tour of the cellars, and delve into some of the rare and precious wines and spirits they have amassed over the years. Accommodating up to 12 guests for a private dinner, The Cellars are also available for wine and spirit tastings, cocktail parties and canapé receptions. For Restaurant Reservations please call 0800 389 3737 and quote “The Sommelier’s Table”. Michelin starred Hedone offers this gorgeous private dining room for up to 16 guests where the menu can be tailored to suit your occasion. The glass walled room offers a fantastic view of the wine cellar and the wines will all be matched by the experienced Sommelier to your meal. For enquiries email reservations@hedonrestaurant.com or call 020 8747 0377. Forming the unique setting for both formal and informal lunches and dinners is this spectacular venue which lies beneath The Stafford’s cobbled courtyard. The 380 year old vaulted cellar houses a world famous wine inventory of between 18,000 and 20,000 bottles. Master Sommelier, Gino Nardella runs informative wine tastings and he enthusiastically leads Stafford guests and dinner patrons on tours through the vaulted Cellars. An enlightening experience for wine lovers of any level, the candlelit tour takes them through the entire $1 million collection, with Nardella fielding questions on a wide range of wine-related topics. To arrange your own special experience in these wine cellars please contact privatedining.london@kempinski.com or telephone +44 (0)207 518 1287. 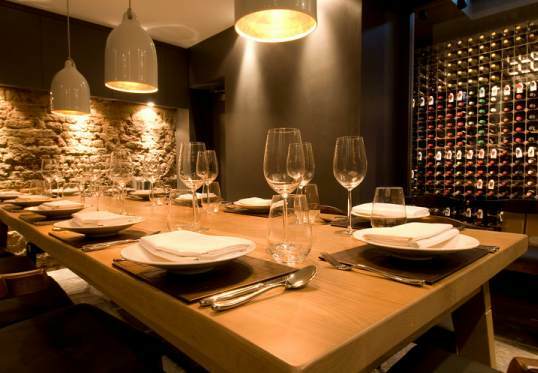 Michelin starred minimalist Indian restaurant, Trishna, has a dramatic and discreet private room placed in the cellar with the restaurants wine collection as a back drop. Featuring tumbled marble and smoked oak the room can accommodate 12 guests. Minimum spend is £750 for use of the room but the menu can be tailored to your own requirements and wines matched by their Sommelier. Many boutique producers are featured in their excellent wine list. For booking details email info@trishnalondon.com or telephone 0207 935 9259. 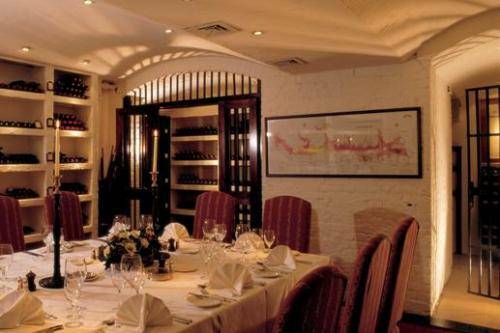 Once Lord Astor’s private wine cellar, the Cellar Dining Room has been beautifully restored and is perfect for a more intimate informal setting. 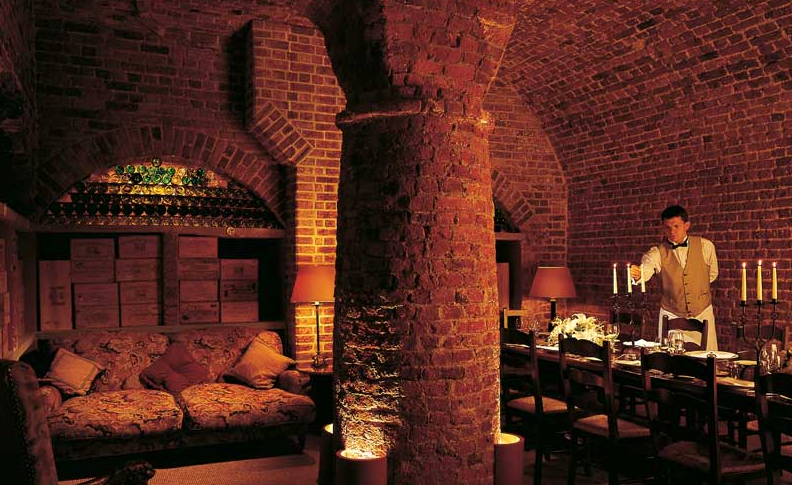 Its brick walls and mighty pillars make an unusual and highly atmospheric dining room. Cliveden is known for entertaining and provides a wealth of history as the backdrop to your occasion, along with exquisite food from their latest acquisition, Head Chef Andre Garrett (read our latest review of his restaurant here). Head Sommelier Guillaume Gorichon is on hand to advise on wines for your special meal and will also be holding tastings in the cellars in the future. For further information call 01628 668561. Beneath this hotel, poised on Richmond Hill overlooking The Thames, is a labyrinth of hidden rooms including the Tasting and Claret Room where bins of ageing wine flank the walls. Private dining in the cellar can be arranged for up to 16 guests for lunch or dinner seven days a week and the Sommelier will pair your wines with your menu. The dining room is also available to hire for pre-dinner drinks receptions, tutored tastings and ‘murder mystery’ themed parties. For further information call 020 8940 7471. 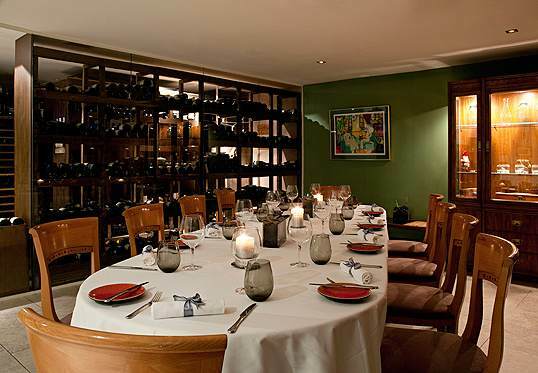 This famous restaurant has a private dining room which is accessed via the Wine Cellar. A wall of glass divides the two spaces with an impressive array of wines from around the world. Catering for 20 guests in the dining room and up to 24 in the semi-private wine cellar, both of them provide atmospheric spaces. For further information contact 020 79401833. The best Christmas Card for 2013? A Design Restaurants Card of course! Go to www.designrestaurants.com to join now and enjoy the season by dining in some of the best restaurants in the country including several of the above – complimentary!